I come awake to the rattle snake sound of the cicadas, nuanced, orchestrated, ebbing and flowing on the air; the buzz of lawnmowers, the swish of tires puckering up from the tarmac.The dog barking in the yard completes the suburban symphony that plays daily in the well to do communities of Northern New Jersey. I have been here two weeks, long enough for my life to fall into my familiar patterns-coffee in the garden, then a morning of writing before the need to move my blood sends me out for a walk. There is really nowhere special to walk, and no people to sit and watch. One can walk for miles to the East or West and find nothing but one large, well landscaped home after another. But I have found that if I walk south, off the “hill” and into “The Valley” as it is called, I will find a small mall, and beyond that, streets filled with people walking on them; all black people. The single-family homes are a little run down, a little closer together, a little less randomly landscaped. The people openly stare at me, an old white woman hobbling through their streets. There are candy bars as well that capture the spirit of the country: Baby Ruth, a delicious combination of nougat and peanut covered in milk chocolate named after one of America’s greatest baseball player’s, Babe Ruth. But right up there with apple pie and Baby Ruth are donuts. While almost every country in the world has its own version of yeasted, fried dough covered with sugar or filled with jam, American donuts are in class by themselves. 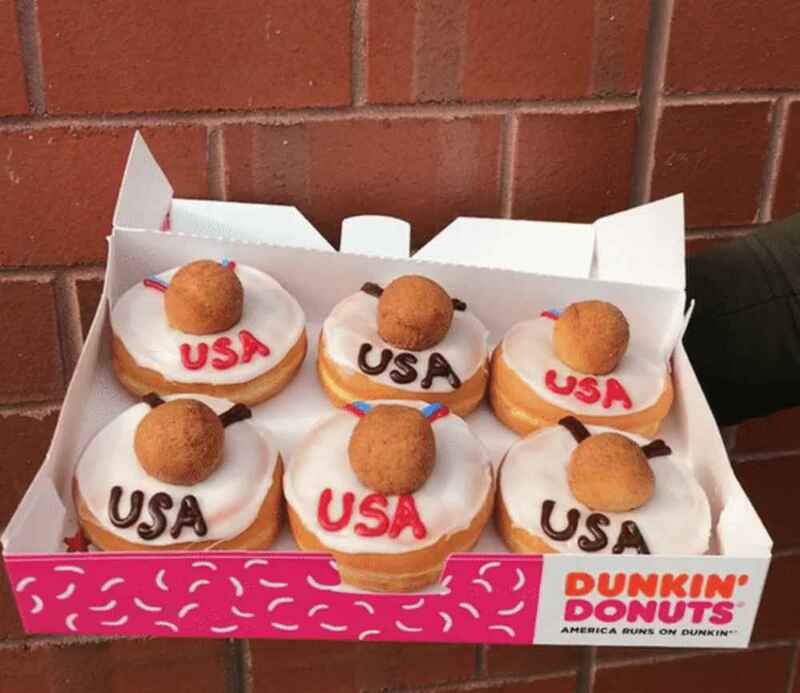 They are an institution, and the multinational corporation which has managed to dominate the donut market is Dunkin Donuts. Several years ago, they entered the Russian market, where they are popular, but not nearly as popular as they are in America. Of course not. Entering this Dunkin Donuts in Northern New Jersey the familiarity of it all overcomes me, makes me feel centered in the universe. I step up to the counter and order, of course, an apple fritter donut. Can’t get much more American than that. Well there is always plain jelly or Boston Crème, but I got the one with the apple pie filling, as I am feeling as American as I have ever felt. I order a coffee as well and sit down at the table to wait out the rain. I come here often and talk with the workers. But Babette has never been there before; and Babette is a force, and, dare I say it, is“as American as apple pie.” She jokes and laughs with the other employee, and with the customers, and then, with me. There seems to be no end to her energy. Let me say it again, she is as American as apple pie. She has worked for Dunkin Donuts for almost three years and has recently been appointed an intermediate level manager. What her promotion means to her, and she knows it, is that whereas when she worked as a simple hourly employee she made a little over eight dollars an hour, she now makes slightly more but is an “exempt” employee. As an exempt employee she now does not get paid an hourly wage, but a weekly salary, and can be asked to work over forty hours a week and not get paid any extra for working those extra hours. She doesn’t think she has any benefits such as medical insurance – she says she has never even checked. She talks of other companies, better companies, that pay between 11 and 15 dollars an hour, but something in her cannot bring herself to leave. It is really the dignity, the pride, the status of being a manager that has a hold on her, keeps her where she is. She is living proof of the truth of Maslow’s Needs Hierarchy Theory. All the while she is talking she is constantly moving: picking up trash, serving customers, taking newly baked products out of the ovens and fryers and putting them in their proper places. When she steps from behind the counter to straighten the stools, I can see that her legs are very strong, they are what weight lifters call “cut” – every muscle bulges and is clearly defined. This is from hours of standing and lifting and bending, from hard work and a lot of walking. We talk about traveling, and I tell her all the countries I have been to, and she sighs. “You know where I have always wanted to go?” It is a rhetorical question. “To Cancun.” “Nice there” I respond, “why don’t you go? Don’t you get vacation?” Obviously, she doesn’t take it. “I took two days off and went to Atlantic City last week. I lost two thousand dollars.” She looks at me sheepishly and shrugs. “You should have gone to Cancun.” I respond. And I understand, that for Babette, even though she is aware she is being overworked, exploited, taken advantage of, there is something deep inside her, something very American, that drives her to work hard and be responsible. It is something that is instilled in American workers almost from birth; this acceptance of what is, this doing of things that are not in one’s interests to do, this taking up of the rock, the rolling of it up the hill, only to return to the same place tomorrow to take up the same heavy burden again.I can see no difference between Babette and Camus’ Sisyphus.